The wide variety of props in John Copley's classic production is intended to create an engrossing and believable world. Our 'How to Stage an Opera' series offers different perspectives on the practicalities of staging an opera, from the initial research through to the final performance. Here we see how the director and designer of La bohème intensify the reality of the story on stage. 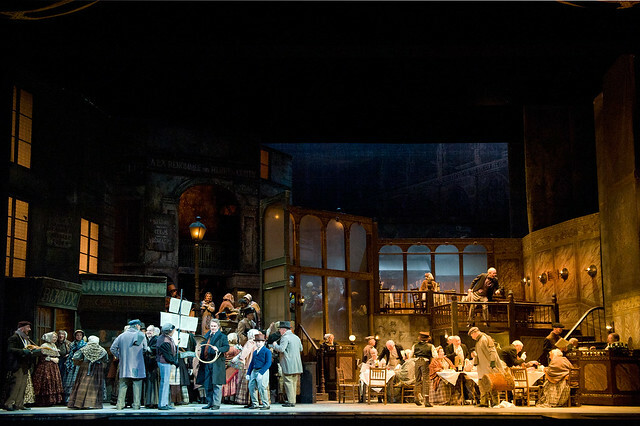 John Copley’s production of La bohème is the longest-established production in The Royal Opera’s repertory. It had its premiere on 6 February 1974, and right from the start audiences and critics noted the detail used to create the stage image. And a very particular image it is too. Julia Trevelyan Oman designed the sets and costumes with her usual forensic approach for accuracy; the opera is set in Paris in 1830, and so that is exactly what we see. As the curtain rises for each of the four acts we see a tableau of lifelike clarity. The attic of the students in Acts I and IV has bare floors, a stove, basic wooden furniture; and the bohemians huddle against the cold that you can almost feel whistle through the pokey windows. Act II splendidly uses three levels and a split across the stage to give a panoramic sense of a Parisian bustling street outside and the inside of the Café Momus – complete with waiters, food and billiard table. Act III outside the Barriere d’Enfer (a gateway into Paris) has the railings, a parked cart with its load – and snow for a cold morning at dawn. All through the opera props are needed – a manuscript for burning, food to eat, a shoe to scream about, toys for children. The list is seemingly endless and gives stage management much to prepare. Each prop relates directly to the libretto, which includes so many specific points of movement and use of objects – although, that said, Act IV's memorable cricket match using bread and a coal shovel is Copley's own invention. Why make everything so busy, so complicated? The first reason is simple. It is the same approach as a television period drama – think the BBC and Jane Austen! The creation of the whole picture draws us into a very specific world so that it becomes believable. Even in the theatre, that underlying sense of naturalism in appearance can support the sense of ‘realness’ of the characters and the story. 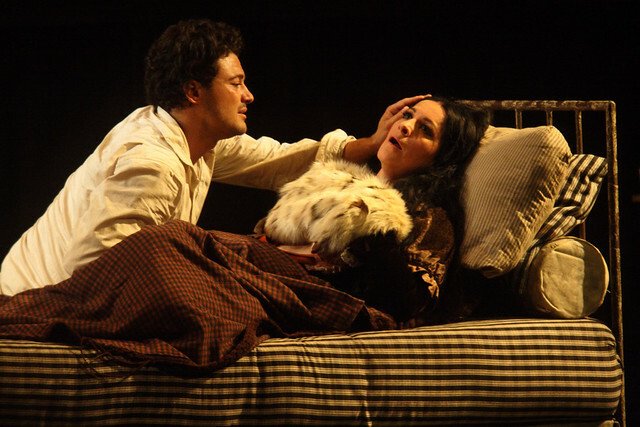 Puccini and his librettists worked hard to bring the characters alive in consistent and believable ways, so a detailed approach to production matches their intentions well. As with a period drama in film or on television, the completeness of the period imagery helps an audience concentrate on the characters and the emotions within the stage landscape. From this there can be a sense of time travel through the comparisons it invites with our own times. What of the people we are watching and their society is different from us and ours? And what is still the same? In particular the emotions of the human condition – love, anger, grief, joy – become clear as common to every age. There are also practical aspects with such a set-and-prop-heavy production. Copley consciously uses the different levels of the set of Acts I and II in particular to create movement. With the need for props to handle, the performers are obliged to pick them up, use them, even throw them. They have to climb up and down stairs, sit on chairs or move them aside, carry baskets, eat food. But you’ll notice too that in the strong emotional moments between the principal characters, such as the seductive conclusion to Act I and the traumatic quartet in Act III, nothing in the staging distracts. Action and stillness play off each other, like the wide shot and the close-up in film. Physical motion propels us through the plot, while a slowing or suspension of physical action becomes intense and emotional through the contrast. Not all opera librettos and scores provide as many naturalistic cues as you can find in La bohème. But when they do, the observing of such minutiae can create an engrossing and believable world. It is artificial to re-create so precisely a time and place that no longer exists, yet paradoxically the result feels so lifelike. At the heart of all great theatre is the creative use of the boundary between the unreal that we know is really artificial, the unbelievable that we choose to believe. 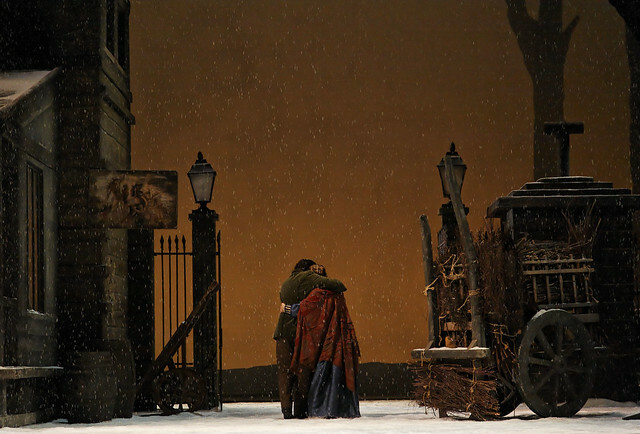 When done with the level of care as in this classic production of La bohème, a naturalistic style of production can draw the audience into the completeness of a convincing, onstage world: you feel that you are really there. Read other posts in our 'How to Stage an Opera' series. 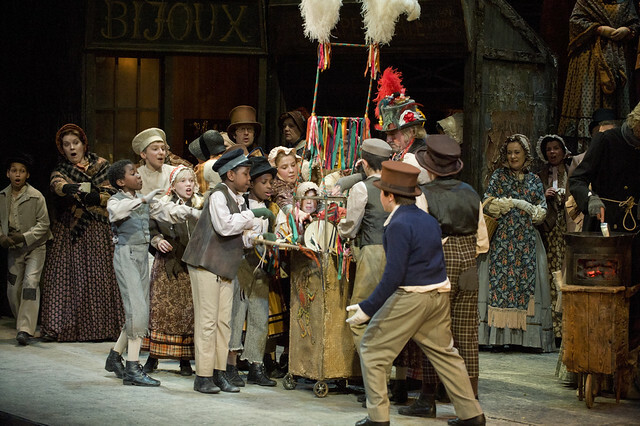 La bohème runs until 19 July 2014. Tickets are still available. The production returns for the last time in the 2014/15 Season, running 23 May–16 July 2015. Tickets go on general sale on 31 March 2015. The production is staged with generous philanthropic support from The Royal Opera House Endowment Fund. Original Production (1974) supported by The Linbury Trust. This article perfectly illustrates why the current trend towards updating nearly always fails. The article points out how the immersive historical style invites us to comparisons with our own world. The invitation acknowledges the intelligence of the audience rather than bludgeoning the message home with a sloganising modern setting. As the article points out, Puccini and his librettists worked hard to create a believable world and the way some modern productions ignore the composer's own instructions betrays a breathtaking arrogance. I have just seen the Copley production and it is better in all respects than the Manon Lescaut I saw recently in which a semi modern setting made the whole story unbelievable.